Save thousands off of your pre-construction condo purchase in exclusive pre-market prices, free upgrades, complimentary parking spaces, discount lockers, private floorplans, and more. Transit City TC4 Condos is the fourth of a six phase master-planned transit city community in Downtown Vaughan which is a 45 storey tower with 530 mixed units ranging from one bedroom, one bedroom plus den, and two bedroom layouts. The units will range from 471 sq. ft to 695 sq. ft -- starting from the high $300s with all suites under $600,000. Line 5 is the first phase of a two-tower preconstruction condo project being built at 117 Broadway Avenue in the Yonge and Eglinton area as a joint venture by Reserve Properties and Westdale Properties for expected occupancy in 2022. KING Toronto is a new condo development by Westbank Corp and Allied Properties REIT currently in preconstruction at 489 - 539 King St West (West of Spadina) in the King West Fashion District area with a total of 495 units across 16 stories with occupancy expected for 2023. Find calm away from the commotion. A chic sanctuary that says you’ve moved up. But you don’t have to move on. With a walk score of 99/100, the best dining in the city is only minutes away. 543 Richmond Condos has a total of 476 units. Playground Condos is a new 35-storey Condo development by Cityzen located at Ordance and Strachan, Toronto. Playground Condos' central location is perfect for young urbanites who work in the downtown core. King West Village is also known to rent at a premium making this development an attractive choice to the investor. The development is proposed to be a 50-storey building on the southern side of Gerrard Street featuring a 4-storey podium plus a 46-storey tower, and including retail space at the street level. With 112 suites, there will be 10 one-bedroom suites, 10 one-bed + den suites, and 92 two-bedroom and two-bedroom + den suites. 1181 Queen Street West will retain it's retail space with over 7,500 sq. ft. of newly built retail space on the ground floor. Daniels Waterfront Condos Lighthouse East Tower is the newest addition to the Daniels Waterfront – City of the Arts. It will consist of 36 storeys and approximately 360 units. Era At Yonge Condos will have 19 stories and 232 Units, with unit sizes from 580 to 1355 sq.ft. Amenities include party room with Kitchen and Bar, Outdoor Terrace with BBQs, His/Her Sauna and Change Rooms, Large Fitness Room, 24-Hour Concierge Services, 1 Guest Suite. Situated near the Wilson Subway Station, this project is a quick train ride in proximity to downtown Toronto. This high-rise residential condominium will ascend 16 storeys atop a 6 storey U-shaped podium. Scheduled for completion in 2021, Lakeside Residences has a total of 1148 units, sizes range from 460 to 1012 square feet. Seven towers featuring world-class amenities and over 30,000 sq ft of retail will bring upwards of 1000 new residential units to the rapidly growing neighbourhood. Located at 1 Bloor St W on Yonge & Bloor, grandeur and excitement encompasses The One. This 80 storey tower will be the second tallest tower in Toronto next to the CN Tower, with 72 levels of apartments on top of an eight-level luxury shopping mall. Panda Condos will consist of 30 storeys and a total of 579 units, including a 3-storey commercial base and a 1-storey mezzanine. With nearby access to Yonge-Dundas Square, Eaton Centre, Ed Mirvish Theatre and more, it has a walk score of 100! Social Condos is a 602 unit, 52-storey residence in the heart of Toronto’s downtown core just steps to public transit, shops, restaurants, top universities, cinemas and more. Anticipated for 2022, it is set to rise in a top investor location, as condo values in the area have increased, on average, 28 per cent in Q2 2017 year-over-year. With a move in date of 2020, the property will feature a total of 408 units across 47 storeys. Combining striking modern architecture with charming heritage buildings, you will discover a brilliant fusion of luxury and sentiment in an exciting landmark location. The world’s first Nobu-branded, condominium Residences located in the heart of Toronto’s Entertainment District consisting of a U-shaped complex with twin 49-storey towers with 718 mixed condo units. Water’s Edge at The Cove is a new condo project by The Conservatory Group and is currently in pre-construction. It will be a 56 storey tower with mixed condo units. The suites at Water’s edge at the Cove offer an atmosphere of remarkable style and complexity. Zen King West Condos is the newest property by CentreCourt Developments located at Strachan Ave and King St W in Toronto. This 32 storey tower features 480 suites with phenomenal views, beautiful glass windows, dark accents, and top of the line features and finishes. The expected occupancy is in 2020. Artists' Alley is a new mixed-use condominium development currently in pre-construction near University Avenue and Dundas Street West in Toronto, Ontario by Lanterra Developments. It consists of a 54 storey tower and two mid-rise buildings with ground floor retail in all three buildings designed by Hariri Pontarini Architects. GO.2 Condominiums is an oasis of relaxation and rejuvenation, while excitement and adventure await you in the nearby Village of Maple. A beacon of beautiful architecture and thoughtful design, GO.2 is set in an unparalleled location for convenience. Sonic Condominiums is a 2 story tower development coming to the intersection of Eglinton East and Don Mills. Sonic will consist of a 28 storey tower designed by architectural firm Page + Steele IBI Group Architects offering 320 suites designed by celebrated interior design firm Union31. Time and Space Condos in The Island neighbourhood consisting of a 29-storey tower with 1,586 mixed condo units. Time and Space Condos will contain four residential towers. Amenities include an inner-courtyard that will double as a Privately Owned Public Space and a 10-storey podium. Transit City is the first residential complex to be developed at SmartCentres Place -- a 55 storey condominium with 551 units. Estimated completion date set for 2020. Located in Toronto’s Entertainment District, this community of transitional design will be comprised of two towers, 12 and 14 storeys tall, with a striking podium. YongeParc Condos is a new pre-construction Condo located at Highway 7 and Yonge in the heart of Richmond Hill. YongeParc Condos have 18 stories and 202 units, with unit sizes ranging from 580 to 1355 sq. ft.
Icona Condos in Edgeley neighbourhood consisting of a two residential towers 53 & 51 storeys with approximately 1,140 mixed condo units. Icona Condos will be Vaughan’s tallest towers the base of which will include 20,000 square feet of retail areas. Mills Square Condos is the third phase in The Downtown Erin Mils community consisting of a 18-storey tower with 198 mixed condo units. The Downtown Erin Mills Square community will contain four residential towers (18 storeys high). 75 The Esplanade will feature a 34-storey tower consisting of approximately 350 residential units. The 7 storey podium fronting on the Esplanade and an 11 storey podium fronting Church Street. Axis Condos will be the tallest structure in the neighbourhood consisting of a 38-storey tower with 541 mixed condo units. Boasts of 7,000 sq ft of amenity space with top notch equipment and open workspace area designed to encourage innovation and collaboration. Estimated completion date set for 2020. Home. Power + Adelaide will be the new landmark in Corktown as a 22-storey building with 532 condominium units and 73,000 sf of retail space. Max Condos will be a 38-storey tower with 349 mixed condo units. With 345 bicycle parking spaces, 128 vehicular parking spaces within a 5-level underground garage. Estimated completion date set for 2020. Sage Prestige Condos will feature a 12-storey tower consisting of approximately 360 residential units. The building will be fronting on the main vein to the downtown area of Kingston on Princess Street. Estimated completion date set for 2020. The main tower will consist of 25 storeys with approximately 200 residential unit. 1/2 an acre of parkland and 12,000 sq. ft. of retail space. Estimated completion date set for 2020. The building will consist of 14 storeys and 173 units; with it's unique L-shaped design described as 'the cottages of the Toronto islands'. Estimated completion date set for 2020. The main tower will consist of 27 storeys with 236 residential units and 48 additional townhouse units. Designed by TACT Architecture on top of a beautifully landscaped community park. Estimated completion date set for 2020. The ultimate luxury is found in classic design. 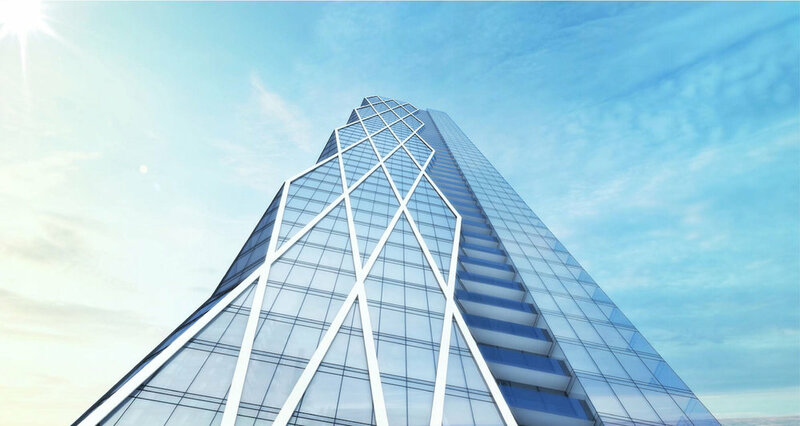 Halo stands proudly on Yonge Street, sophisticated and refined holds 423 units. Estimated completion date set for 2020. Sign up to stay tuned for all of the best pre-construction condo deals in Toronto. This is how you’ll find out about platinum offers as soon as possible.